European Elections are now taking place until May 25 and this year, the next President of the Commission is to be appointed in connection with the results of the European Elections. The Elections will give more than 500 million EU citizens the chance to vote for people they want to represent their interests in the EP and 751 MEPs will be elected. Except for Belgium where voting is compulsory and for Luxemburg which seems to be the only Member State where citizens give importance to EP elections, the turnout for the elections 2014 should be lower than in 2009, with around 60% of abstention. The EU as an influence on our everyday lives but citizens, in many case, don’t know what they are voting for, don’t know how is the election working, neither the role of the European Parliament. The European Parliament is the main player when it comes to the decision making process at the EU. MEPs serve on five year terms and once they are elected they usually join a transnational political group – like an alliance between national parties from across Europe. Today, the EU has seven political groups comprising of more than 160 national parties and no group has ever had an overall majority in the European Parliament. 25 MEPs are needed to form a political group. The seven political groups are: EPP – European People’s Party (Christian Democrats), S&D – Progressive Alliance of Socialists and Democrats in Europe (centre-left), ALDE – Alliance of Liberals and Democrats for Europe (liberal), EUL/NGL – European United Left-Nordic Green Left (left-wing), Greens/EFA – Greens/European Free Alliance (Greens and regionalists/nationalists), ECR – European Conservatives and Reformists Group (right-wing), EFD – Europe of Freedom and Democracy (Eurosceptic), NA – Non-attached (MEPs not part of any group). MEPs are tasked with sitting on parliamentary committees, of which there are 20 in total, with each committee in charge of certain policy areas. It is in these committees where draft legislation drawn up by the European Commission, a body made up of 28 commissioners, one from each of the EU member states, is scrutinised and amended before being presented to the European Parliament to vote on. The European elections are decided using a proportional representation system of voting. Voters will be given a ballot paper which lists the political parties and the candidates they have put forward for the election. Voters only get one vote. Once votes are counted up seats are handed out to the parties with the most using a quota system. The first seat a party wins will go to the first person on their candidate list, the second will go to the candidate listed second and so on. However, it is important to remind that the votes can be different depending on the Member States. In Ireland, Sweden, Denmark and Finland, the citizens are voting for an MEP directly rather than a party list which bring a direct relation and involvement between the voters and the elected MEPs as the last ones have to engage with the public. 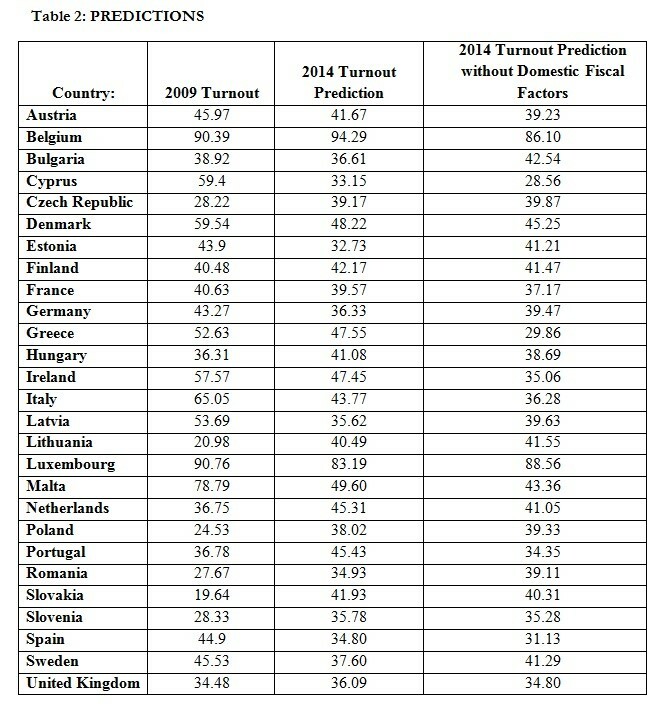 Even if the prediction of those 4 countries seem to be superior to the average, it still remains under 50%. With a low turnout for the elections, the EP is going to face legitimacy problems as it is really important for the EU to convincing people in order to build a democratic institution above already democratic member states. However, with 60% of abstention, it remains difficult to accept the results as a reliable guide to national opinion as a whole in any the 28 countries. Lack of enthusiasm from the citizens, but also from the media. There is not a lot at stake in the European elections as it is not clear for the citizens how those elections are going to change people’s life, even if decisions made in the European Parliament over the next five years will shape Member States policy. 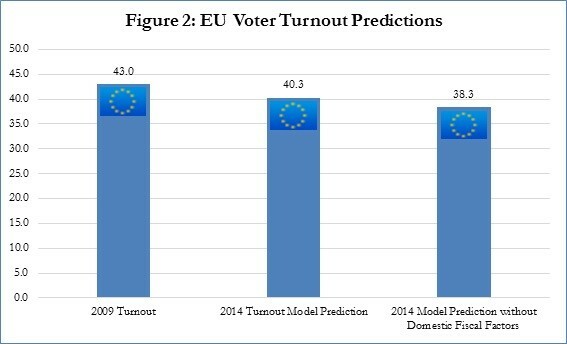 People don’t really give importance to the European elections and it does not look like the turnout will go up. National media played a relative role in the little interest citizens are giving to the elections as they don’t spend much effort on the European election coverage. The public carries on not liking much the EU and for many people, the EU is nice but meaningless. Some EU citizens think that the EU is just creating regulatory rules but no genuine rules for them. 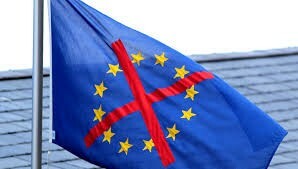 The EU is sending a wrong, or at least negative image of what it is doing and in short give the impression to oppress the national freedom and sovereignty. The coverage of the media, as little it is today, could have been worst if there will not be a rise of far right or anti-EU parties and the mainstream parties have hardly been doing any sort of campaigning. Increase of migration across the EU and the Eurozone financial crisis have helped the rise of anti-EU parties across Europe. However, the EU is not the only responsible as the rise of those parties can also be seen as a reaction to individual national governments. Anti-EU party are enjoying a surge in popularity. “No to Brussels, yes to France. Do not fall into the trap of abstention. Do not disappoint me, go and vote!” said Marine Le Pen (FN) in front of her supporters. As fascinating as it seems to be, the majority of the citizens who are going to vote for the European elections, at least in France, are the one who want to leave the European Union. According to a April 25 poll by CSA on behalf of the BFM-TV channel and French regional daily Nice-Matin, the FN will be battling it out with the centre-right UMP to come out on top among French voters, leaving the ruling Socialists in third place. The party is on track for 24 percent of the vote, said the poll, leading the party’s 86-year-old founder and Marine’s father, Jean-Marie Le Pen, to claim the FN could come away with 15 to 20 representatives in the 751-seat European Parliament, up from its current three. A report by the Robert Schuman Foundation said that “The far right discourse is succeeding in its bid to convince a public which is disenchanted, which no longer believes in the proposals made by traditional parties and mistrusts the European project which they no longer understand,” and this is not happening only in France. The Eurosceptism movement is getting bigger in any Member States such as in the UK with the UKIP led by Nigel Farage. On the rise of ‘outsider’ parties reveals that of the 25 ‘outsider’ parties making gains across Europe, 16 are eurosceptic, 11 are anti-immigration and nine have been involved in Neo-Nazi controversies. However, leaders of “traditional parties” still believe in a European Dream and even if the far right will gain seats in the next European elections, it will still be defined as a minority, though increased, which will not dominate the EP. The Anti-EU parties, even if they share the same global and general idea, are unlikely to create an alliance and to become a powerful, but still limited, party. The far right parties each have their agenda and goals. “Their division, disorganisation and their lack of discipline and common position on the future of Europe prevents them from agreeing on a political programme.” said the report of the Robert Schuman Foundation. Rivalries between Europe’s various anti-EU parties could be the main barrier to their becoming an effective force in the European Parliament. For example, UKIP snubbed an invitation from the FN because of anti-semitism convictions from the French political party. The FN, on the other side, doesn’t want to be part of an alliance with the Greek Golden Dawn or with Jobbik, the Hungarian group etc. In any case, populist thrust should have a limited impact on the European Parliament, where political forces’ influence should be gauged on the basis of the number of seats won, of course, but also of their internal cohesion as well as of their ability to forge majority coalitions with other parties. Given the fact that populist parties tend to be structurally weak when considering the two latter criteria, their numerical upswing is unlikely to distrupt the functioning of the European Parliament, beyond the incrising presence of discordant voices in the assembly. European elections will have few impacts on any European policy as the EP is based on checks and balances and this will not influence the distribution of committee chairs. This entry was posted on 22/05/2014 by ISIS Europe in Contributors, François Ducrotté, Opinions and tagged ALDE, ECR, EPP, European Commission, european elections, European far right, European Parliament, Greens, marine le pen, nigel farage, S&D, voter apathy, voter turnout in europe.